Lately I've been poking around at some new-to-me programming languages, Haskell and Scheme. I don't expect to use either of them in a serious, practal project (except maybe Scheme for scripting GIMP), but they are both “weird” enough that it's fun to learn them and expand my horizons. You also can't set a variable to something and then set it to something else later. If you say that a is 5, you can't say it's something else later because you just said it was 5. What are you, some kind of liar? I therefore assert that Learn You a Haskell is the most awesome guide to any programming language, ever. But it seems like a really interesting language once you grasp it, so I plan to revisit it later. I also dabbled in Scheme a little bit, following Teach Yourself Scheme in Fixnum Days. Unfortunately, Teach Yourself Scheme isn't nearly as entertaining or thorough as Learn You a Haskell. It's very dry reading, and unless analyzing macro expansions gets you off, you probably won't find it too enjoyable. But, I was already familiar with Lisp, so most of the concepts weren't terribly foreign, and I didn't need as much handholding. For the most part, I just needed an introduction to the terms and function syntaxes peculiar to Scheme. But therein lies a problem: there are lots of Scheme implementations, and they are all peculiar. SchemeWiki.org lists some 70 different implementations of Scheme, and none of them are authoritative. Perhaps in an attempt to remain apolitical, very few of the lists I've found give any sort of indication of which ones are any good. Which are stable, efficient, easy to install and use? Which ones have the most users? What features do they support? Are they still actively developed? Which (if any) of the 6 or 7 Scheme standards are they compliant with? What quirks or extra behavior do they have? Am I expected to download and try every implementation, devise tests and benchmarks to determine compliance, efficiency, and feature set, and then decide which one I want to use to learn the language? Not gonna happen. Even reading the web sites for every implementation is more effort than I'm willing to spend. If there were 2 or 3 to choose from, sure, but not 70. In the end, I just said “screw it” and installed Gambit on the highly scientific basis that it has a cool name. But, I might use MzScheme for learning, since that's what Teach Yourself Scheme uses, and I wouldn't know the difference. I'm still interested in learning more Scheme (at least enough to find out what's so great about call/cc), but the learning experience so far has not been nearly as rewarding or entertaining as it has been with Haskell. 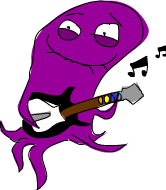 Maybe Scheme needs a tutorial with a sense of humor and an octopus playing Guitar Hero?